NASA's Mars Exploration Rover Opportunity caught its own silhouette in this late-afternoon image taken by the rover's rear hazard avoidance camera on March 20, 2014. Late afternoon lighting produced a dramatic shadow of NASA's Mars Exploration Rover Opportunity photographed by the rover's rear hazard-avoidance camera on March 20, 2014. 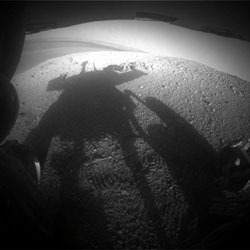 The shadow falls across a slope called the McClure-Beverlin Escarpment on the western rim of Endeavour Crater, where Opportunity is investigating rock layers for evidence about ancient environments. The scene includes a glimpse into the distance across the 14-mile-wide (22-kilometer-wide) crater. The rover experienced a partial cleaning of dust from its solar panels by Martian wind this week, boosting electrical output from the array by about 10 percent, following a similar event last week. That is in addition to increased sunshine each day in the Martian southern hemisphere's early spring. Combined, the seasonal effect and multiple dust-cleaning events have increased the amount of energy available each day from the rover's solar array by more than 70 percent compared with two months ago, to more than 615 watt hours. On March 23, 2004, when Opportunity had been working on Mars for only two months, scientists announced the mission's headline findings of evidence for water gently flowing across the surface of an area of Mars billions of years ago.